Did you know that stressed spelled backwards is desserts? That might just be a coincidence, but desserts do help put a smile on my face! One apple tree can produce over 20 boxes of apples a year. 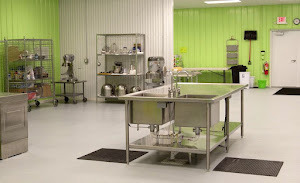 6 times per year, Facility Kitchens holds a PowWow. At Pow Wows current producers and interested food producers meet, talk and build synergy to move their food businesses forward. Our next Pow Wow is on March 15th at the kitchen, starting at 6:00pm. No RSVP needed. We hope to see you there!